Pastor Derrick Jackson was born in the small Mississippi delta town of Itta Bena, Mississippi, the fourth of four sons to the late Mrs. Mary Bell Jackson-Stevenson and the late Mr. Emmitt Stevenson. Pastor Jackson, like many African-American boys born in the rural south, was born to humble, but proud and encouraging parents who wanted their offspring to fully achieve the “American Dream” that often times eluded African-Americans. His background foreshadowed the success he would achieve as an adult. In elementary school, he struggled academically, and he was challenged with a speech impediment. How futile their dream must have seemed as they watched their young son struggle simply to achieve academic grade level at L.S. Rogers Elementary School (a demonstration school). Despite his past struggles and long after having overcome a speech impediment, he graduated valedictorian of the Leflore County High School Class of ’88. Pastor Jackson attended Mississippi Valley State University’s Summer Upward Bound Program and received several academic achievement awards. In the fall of 1988, he enrolled in Prairie View A&M University and earned a Bachelor of Business Administration degree in accounting. He later earned a Master of Theological Studies degree from Vanderbilt University and a Master of Business Administration degree from Keller Graduate School of Management. Pastor Jackson also earned a Doctorate of Ministry degree in missional theology, spiritual formation, and leadership from Lipscomb University. Additionally, Pastor Jackson is a graduate of John A Gupton College Of Mortuary Science Funeral Director’s Program. He is a Licensed Funeral Director as well as a Licensed Pre-Need Insurance Agent. 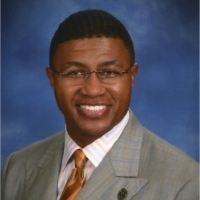 As a result of the promptings of the Holy Spirit and increasingly strained race relations, Pastor Jackson discerned an opportunity for the leadership team of First Baptist Church to lead the church into becoming a premier advocate of racial healing and reconciliation as a part of the church’s commitment to the Missio Dei (the mission of God). Hence, he based his doctoral project on the premise that the church is God’s ideal vehicle to advance the conversation on race, racial healing, and racial reconciliation. His doctoral project was entitled, Racial Reconciliation Efforts Initiated By First Baptist Church Through Its Senior Leadership Team. On October 1, 2001, Pastor Jackson began his pastorate of the historic First Baptist Church of Gallatin. He is the sixth pastor in a series of strong men who made up the rich preaching, teaching and pastoring legacy of First Baptist Church over the past 153 years. Pastor Jackson was licensed to preach by Pastor John H. Gibson of Hopewell Missionary Baptist Church of Itta Bena, Mississippi, and ordained to preach by his father in the ministry, Dr. George T. Brooks, Sr. of Saint James Missionary Baptist Church in Nashville, Tennessee. Armed with prayer, a vision, and a feasibility study, Pastor Jackson and the congregation of First Baptist Church altered Gallatin’s church landscape for the better with the construction of a twenty-eight thousand square foot, three level state-of-the-art worship, educational, and recreational facility located adjacent to the current edifice and a seventeen thousand square foot community life center adjacent to the multi-purpose facility to better serve the needs of the citizens of Gallatin and Sumner County. Out of his concern for the least, the last, and the lost, Pastor Jackson led the church into establishing the Unlimited Potential 501c3 CDC to better serve and equip those with limited resources but unlimited potential. He has also led the church to support foreign mission efforts in Sierra Leone. Under Pastor Jackson’s visionary leadership and the congregation’s steadfast faithfulness, First Baptist Church has experienced tremendous growth spiritually, financially, numerically, and physically. A man of flexible gifts and talents, Pastor Jackson also serves as the Executive Director/CEO of the Sunday School Publishing Board of the National Baptist Convention, USA Inc. Prior to that assignment, Pastor Jackson served as the Chief Financial Officer of the Sunday School Publishing Board and the Director of Fiscal Affairs of Meharry Medical College’s Physician Medical Group. Possessing the entrepreneurial zeal of his father, Pastor Jackson is the co-owner of several business establishments. He teaches Personal Finance and Business Finance at American Baptist College, and he co-facilitates the Justice, Mission, and Kingdom of God travel course at Lipscomb University. He has authored two devotionals: God To His Daughters: A Thirty-day Devotional for Women, and God To His Sons: A Thirty-day Devotional for Men. He is currently completing a three-part church resource entitled, The Church Advancing The Conversation On Race and Racial Healing. Pastor Jackson is a man of immense energy actively involved in denominational, civic, charitable, and community activities. He is the President of the Congress of Christian Education for the East Fork District Association and a Certified Dean for the National Baptist Convention Congress of Christian Education. He has served as the Vice-President of the Middle Region of the Tennessee Baptist Missionary & Education Convention and President of the Gallatin Ministerial Alliance. He is a board member of the Gallatin Industrial Development Board, Gallatin Health, Educational & Housing Facilities Board, Sumner County Habitat for Humanity Board, Salvus Center, Living Sent Ministries, American Baptist College, and Teaching to Change Lives, Inc. He is also a member of the Gallatin Rotary Club, Tennessee Promise, United Ministerial Alliance, and a Chaplain at the Gallatin Police Department.